With Laser Scanner - Worldwide. 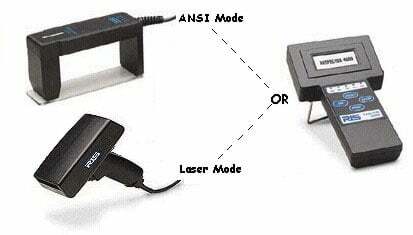 Ideal for customers who want point and shoot and accept PARTIAL ISO/ANSI barcode quality testing worldwide. Report printer (Part# 002-9018) sold separately. Auto Optic (3,6,10,20 mil) - North America. Ideal for customers needing FULL ISO/ANSI barcode quality testing in North America. Auto Optic (3,5,10,20 mil) - Europe and Asia. Ideal for customers needing FULL ISO/ANSI barcode quality testing in Europe and Asia. Combo (3,6,10,20 mil and Laser) - North America. Ideal for high volume production environment when FULL ISO/ANSI AND PARTIAL spot testing barcode quality testing in North America. Combo (3, 5, 10, 20 mil and Laser) - European version. Ideal for high volume production environment when full ISO/ANSI and partial spot testing barcode quality testing. Perfect verifier for ANSI requirements. We needed a verifier to ensure our labels were up to ANSI requirements and the D4000 has really delivered. Saves us a bunch of headaches and money from fines. The barcode verifier Inspector D4000 is so practical, easy to use, affordable and handy. I can easily detect if barcode is pass or fail.